Just announced today, Borderlands: The Handsome Collection will come with many fine things, graphically improved versions of Borderlands 2 and last year's The Pre-Sequel among them. But, if you don't mind missing out on a few bill payments, you can get a talking, remote-controlled Claptrap in a collector's edition. The Handsome Collection bundles together new-gen versions of the last two Borderlands games for the Xbox One and PS4, along with all the DLC for those games. Out on March 24 in the U.S. and March 27 everywhere else, it'll also have four-player splitscreen for folks who dig that sort of thing. Sadly, the Handsome Collection won't include the game that kicked all that irresistible gun-collecting, which means you'll have to hold onto whatever version of Borderlands 1 you might own if you want to re-visit that game. 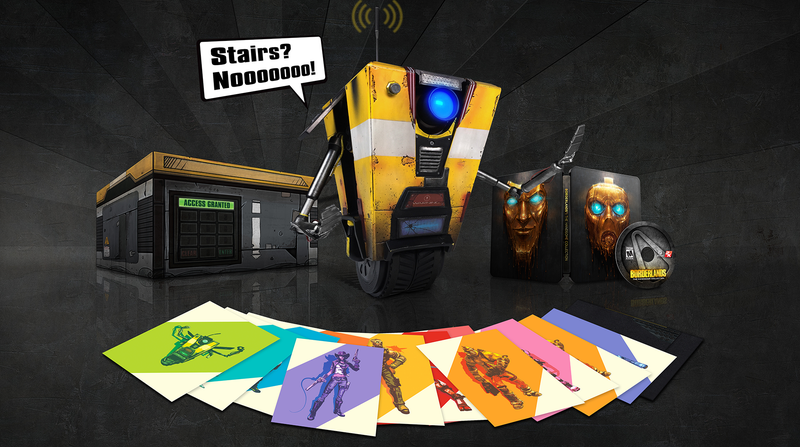 ...the Borderlands: The Handsome Collection Claptrap-in-a-Box Edition, which will include everything in The Handsome Collection as well as a remote controlled Claptrap steward robot, a collectible steel case, and12 exclusive lithographs. The Claptrap steward robot is controlled through a smartphone app and can move in all directions while balancing on one wheel. The Claptrap can also say lines in character and live stream video to a mobile device through his eye. The Claptrap-in-a-Box Edition is limited to only 5,000 units worldwide and is available to pre-order starting today at participating retailers for $399.